A lot of people tend to forget that there is more to Burgundy than chardonnay and pinot noir. In red there is gamay of course, but let’s not forget about césar, an admittedly obscure variety used in Yonne. I have not yet encountered a 100% césar wine, don’t even know if it exists honestly, but it often adds something a muskier, rustic sensation to a wine. The white varieties aside from chardonnay are more interesting. There is a tiny bit of pinot blanc, and aligoté probably takes the lead in the Côtes de Nuits and Côtes de Beaune, but that is not all, When you think about the northern part of Burgundy, Chablis will probably be the first and only appellation that springs to mind. There are however interesting wines based on sauvignon blanc to be found here as well, mainly around Saint-Bris. One of the things I learned in class is that regions in France are not as clearly distinctive from one another than they are too often presented. Saint-Bris for instance is located less than 100km from the Côte de l’Aube, the southern part of Champagne, and is actually to the north of Sancerre and Pouilly-Fumé which are part of the Loire region. Terroirwise it is a bit a mystery as to why the three regions, which all the have the same type of kimmeridgian soil, are part of three completely different appelations. It should anyhow be no surprise that there is varietal overlap. Pinot noir is of course found in Champagne and Sancerre, but the other way around we also have sauvignon blanc in Northern Burgundy (Saint-Bris is a 20 minute ride from Chablis). There is only about 100 hectares of vines planted in Saint-Bris so good luck finding the wines, yet they offer an interesting experience, well set apart from Sancerre or Pouilly-Fumé. Unknown often equals unloved by the general public, which means that winelovers are in luck as the wines are simply excellent value. The leading producer is without a doubt Goisot and today I am presenting their Saint-Bris Corps de Garde 2011. 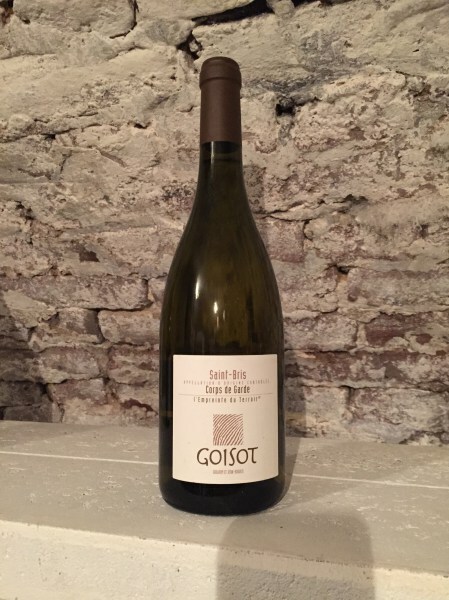 Goisot uses the Fié or Sauvignon Gris, a clone that leads to more substance and body in comparison to the more common variety of sauvignon blanc. The wine starts of quite exuberant and initially a bit one-sided on the nose. I get chalk and slightly grassy tones that become softer after a while, replaced by more floral hints. The chalkiness remains and allows the wine to rocket over the palate, straight to the point but still sufficiently broad, ending quite herby but delicate. It is a perfect food-wine as it is not too overly present but focused, perfect for the scallops and asparagus we enjoyed with it.